We do not recommend Winner Poker at this time. If you're looking to play online poker then we recommend 888poker. 888 Poker is one of the top European poker rooms today. All links will redirect to 888. Winner Poker is one of the many who make their home on the popular iPoker network. 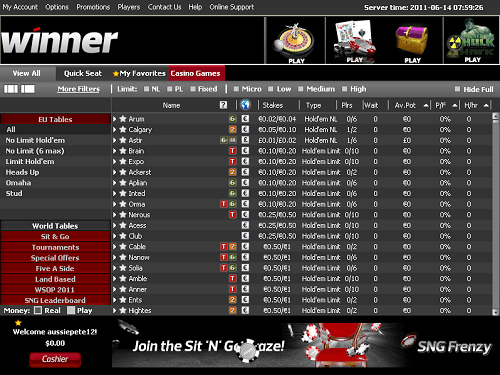 It’s thanks to sites like this one that iPoker is currently the 3rd most popular network in the world. 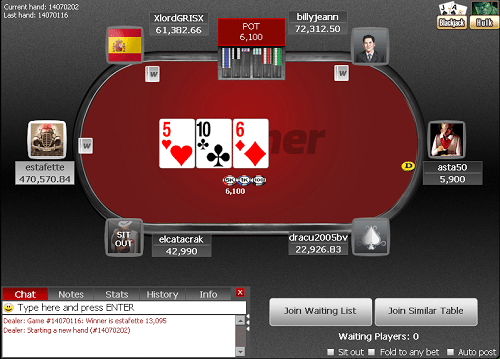 Only giants PokerStars and Full Tilt can outdo them when it comes to player traffic. The site uses a lightweight client designed by Playtech, who are famed for their gaming software expertise. The program uses state-of-the-art 128-bit SSL encryption to ensure that all data transfered is kept as safe as can be. This is just one of the many safety procedures implemented by Winner Poker to ensure that their customers can play online poker in a safe and secure environment. The install file is only 345 KB big and should be downloaded in a matter of seconds on a DSL connection. Open up the installer and you’ll be asked to choose between the six languages in which it is possible to run Winner Poker. English, French, Spanish, German, Russian, and Swedish are all available – making this one of the more accessible clients for European users. The Euro-skew is necessary, given that they do not currently allow US players to register an account. With your preferred language selected, the installer will download the bulk of the software and install it to your hard drive. Overall the whole process shouldn’t take more than a few minutes. The layout of the Winner Poker software should be instantly familiar to anyone who’s ever fired up an iPoker or Playtech client before. The table view is as you would expect, with a simple list containing all the relevant information. To navigate between cash games, tournaments, and S&Gs you click on large silver buttons. These reveal a traditional ‘file tree’ system, where you can open and collapse different games, stakes, and tournament types to find the specific kind of poker you crave. Overall the software is functional and pleasant to look at, although there is one major annoyance. If you log on for the first time you will be immediately bombarded by a live-chat window, where a Winner Poker representative insists on telling you about a current bonus deal. Even if you close the window, it will pop up 6 or 7 more times while the support representative continues to shill their latest offer. It may be a short lived annoyance, but it’s a pretty poor way to greet new customers.